I have just finished reading what is, perhaps, one of the greatest 20th century novels in the English language. The author, Ford Madox Ford, is certainly not unknown, particularly as Parade’s End came out as a successful BBC miniseries in 2012, with the protagonist played by Benedict Cumberbatch. 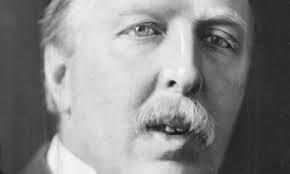 However Ford Madox Ford is certainly not a household name and even literature majors are unlikely to have come across his name, causing a documentary on him to be titled “Who on Earth was Ford Madox Ford?” Ford pioneered the modernist novel by applying the artistic style of Impressionism to literature and helped a generation of writers including Graham Greene, Ernest Hemingway and Joseph Conrad, but died in 1939 resenting the fact that his name would not be included with the ‘greats’. While most people will identify with the love triangle in Parade’s End between Christopher Tietjens’ estranged wife Sylvia and his mistress, Valentine Wannop, I want to focus on the character of Christopher Tietjens, and the actions he takes in the face of a world always on the brink of absurdity, where people behave irrationally and cover it up as the ‘proper’ way to behave. Parade’s End glances back from the 1920’s over the years surrounding the First World War, a crumbling world where politics is inexorably overwhelming civil society, dragging it into a war that would send eight million innocents to their deaths. Ford pillories the elites for exercising their power through lies and fear, causing people’s lives to be filled with needless anxiety and tragedy. Tietjens, whose integrity in fiction is only matched by Jean Valjean in Les Miserables, lives his life as if he walked straight out of the 17th century (shades of Albert Jay Nock) refusing to bend on matters of principal and notably refusing to go along with the lies that the Ministry of Statistics wants him to prepare. Would that Google, Microsoft, Verizon and other blue chip companies, had employees who were willing to stand up, in a similar way, to the bully boys at the NSA. Of course if you live your life by an outmoded code of behavior, people will take you for a fool and act accordingly. Tietjens is bankrupted, his name disgraced, and his father killed, albeit inadvertently, by his enemies. Although recognized as a genius by his colleagues in the Ministry of Statistics, he decides to enlist to face honest bullets and shells in the trenches, rather than stay at the Ministry dishonestly helping to justify the stupidities of war at the behest of his hypocritical paymasters. Even on the front line he adheres to the principal of what he calls ‘Parade’ – the code of behavior he expects of a man of his standing. Parade’s End has the scope, drama and social conviction of a 19th century novel, presenting a startling vision of a social and moral order in turmoil, with the war as a symptom of a wider, chronic malaise. Today we are faced with a similar situation in Europe where political and economic ties are dissolving, political hypocrisy is pervasive, and the financial elites are exercising increasing control. The relevance of Parade’s End is that there appear to be very few good men left, but Tietjens is exactly that, a very good man. Great review. FMF certainly deserves a wider readership. Thank you. It makes you wonder what is needed to obtain a wider readership. Talent is necessary but clearly not sufficient. It makes me wonder how many great writers we’ve never even heard of. One of the great mysteries, I guess. Luck has a prominent role. Mikels, I agree with you. Excellent point. Great post Malcolm. I loved the mini series ‘Parade’s End’. I know that it was semi-autobiographical depicting the author’s own trenchant life, having fought in WW1 and survived to tell this tale. Benedict Cumberbatch is a wonderful actor and his portrayal of a pseudo-biographical Ford Madox-Ford highlighted the man’s sensibilities, his passion for women and his deeply ironic but subtle sense of humour. Inspirational stuff indeed. Ishaiya, thank you. Benedict Cumberbatch said he fell in love with the character of Tietjens which makes me admire him (the actor) even more. Nico, thank you. I have to say that Cumberbatch was very impressive as Christopher Tietjens. He clearly knew the character inside out. Great post! I’m actually in a master’s level American Modernism Lit course right now and I’ve not seen Ford’s name within any of our textbooks or reading lists. I’m not familiar with him or his work but it sounds like a great read. I’ll try to acquire a print and read it when my schedule permits. Of course, one of my biggest complaints about being swamped with school-required reading is that I have little time to “catch up” on my personal reading list. I keep adding books but rarely get to mark any off the list. That being said, I did finish a few greats over the holidays. Thanks for sharing! Duncan, thank you. It’s also available as an audible book so you can listen to it while out in the woods. The BBC miniseries is also well worth watching. Not surprised to hear FMF is not mentioned on your course. It just shows that talent is not all that is required to become well known. Agreed. On a similar note, last term I wrote a paper about George Washington Sears’ (The inspiration for SmoothingIt.com) omission from the “great” nature writers. I guess that sometimes the literary critics get it all wrong. Duncan, thank you. I just looked up Sears who I had never heard of before and he does seem a very interesting figure. If you are willing I would very much like to read your paper on him. Just published it. I hope you enjoy. Duncan, I did enjoy it and clearly Nessmuk merits greater exposure. Am looking forward to reading his Woodcraft and Camping. Wow, you have made made me want to read the book! Iris, thank you. I’m sure you will enjoy it and please see my comment to Dalo 2013. Will have to include this book on my reads in ’14, fantastic write up. Thank you. Don’t neglect to watch the BBC miniseries too. Tom Stoppard wrote the screenplay and did an excellent job. Thank you for a wonderful take, Malcolm. My father made me learn Kipling’s “If” when I was young, and it does seem as if almost anything can find an echo there. (“If you can keep your head when all about you are losing theirs . . .”) We’re Cumberbatch fans here, with Parade’s End in our queue. Buzz, thank you. While you are at it you might also want to add to your Netflix queue ‘The Good Soldier’ with Jeremy Brett, another film based on a Ford Madox Ford book. The relevance goes beyond Europe. It’s the simple but most difficult matter of integrity and honoring what you know to be real or true. Bullying doesn’t stop past the schoolyard. Thank you and I apologize for the late reply. That’s exactly what lifts this novel from being parochial to being one of the truly great novels of all time. I have never heard of Parade’s End, but I must go to Amazon and find the novel. Sounds like a book I would enjoy. Kate, thank you. Happy to spread the word about Ford Maddox Ford.